I’ve been away from the blog for a while, a good month or so and I will share a post soon letting you all know where I have been for the first part of 2015 – that’s a story for another day though. It has been quite a while since I have posted a recipe on this recipe blog, there have been a lot of restaurant reviews and there will be more coming up soon too. Looking back it was way back in December that I last posted about a recipe, which was for Spicy Mexican Enchiladas, a recipe you can find here. So with the fact that this is a cookery blog let’s get back in the kitchen and cook up a delicious dinner. 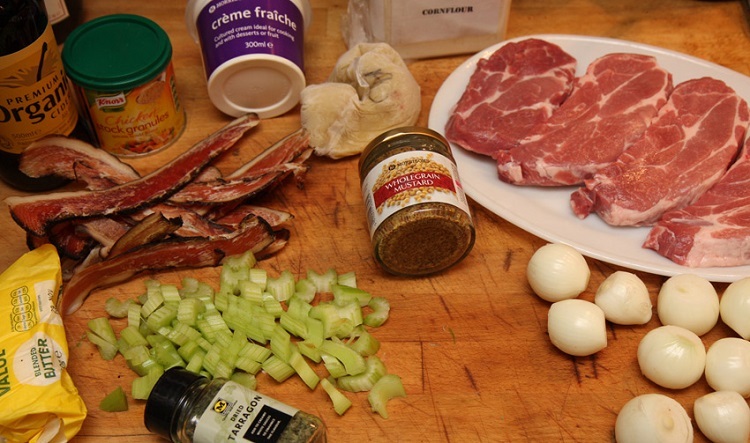 I found this Normandy pork & cider casserole recipe recently and wanted to try it out so earlier this week I got in the kitchen, threw on a apron and got cooking! It makes enough for four hungry people so if there are just two of you, like Hana and I, then it makes more than enough for two meals and the leftovers keep fine in the fridge for a couple of days. It is a really simple dish to prepare and to cook, with very little effort involved to get a great tasting meal at the end. At one point you’ll pop it in the oven for a couple of hours and you really can just walk away and forget about it – I went to the gym with Hana whilst it slowly cooked away. You can find the original recipe on WomanandHome.com. Preheat your oven to 170 C and have your casserole pan on hand. Prepare all the ingredients as above. With the baby round shallots just peal them and leave them whole – they’ll cook down a lot in the oven. Heat the butter in a large heavy bottom saucepan, add the pork and fry for about 10 minutes or until thoroughly browned. Remove the meat from the pot with a slotted spoon to a plate with some kitchen paper on to drain any fat. Meanwhile, in another pan, dry-fry the lardons until crispy. Remove, set aside and drain on kitchen paper. In the same pan fry the whole and chopped shallots and celery in the remaining bacon fat for a few minutes, to soften slightly. 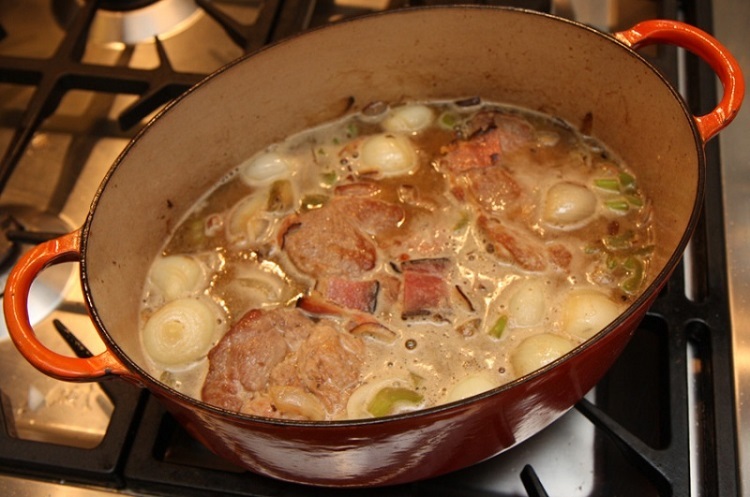 Combine the pork, lardons, the whole and chopped shallots, and celery in the casserole dish. Pour over the cider and chicken stock to just cover. Pop the lid on and cook in the oven at 170 C for 2 hours until the pork is tender. Remove from the oven and pop on the hob. If your casserole pan can’t go on the hob then decant to a very large saucepan. Add the cornflour mix, crème fraîche, mustard and chopped parsley to the pan. Gentlhy heat on the hob and stir until the sauce has thickened to a consistency you are happy with, I prefer a thicker and richer sauce. Glad you like it Ema, it is a really lovely dish!